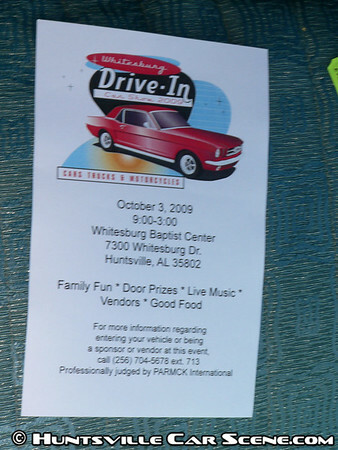 October 3rd, Whitesburg Baptist Church in Huntsville will have their 2009 car,truck and motorcycle show. Early registration is $20. Dash plaques and T-shirts will be awarded to first 150 registered. Vendors booths are $15. We will have food, moon bounces for the kids, door prizes, live music, and lots of family fun. We'll have the show at the Whitesburg Baptist Center at the corner of Whitesburg Dr. and Byrd Spring Rd. The point of contact for the church is Mrs. Debbie Milner. Her contact info is debbie.milner@wbccares.org or you can phone her at the church 256-704-5678 ext. 713 Hope to see you there. Professionally judged by PARMCK International. I think a lot of people will be. It's been promoted for several months now. I won't be at this event as I'm the official videographer for the Crow Mountain Hillclimb. My entire weekend is dedicated to that event. Not working for the man any more...wait that's a bit of a bad thing isn't it? Is anyone else from the website taking photos? If not I can get some to Samir somehow. No one else has indicated so. You can reach me anytime at 615-512-5520. I can meet you, and if you can put them on a flash drive, we can copy them pretty quickly. Last edited by Samir; October 1st at 05:39 PM. I will be taking some, probably not as many SAMIR but will get a few. Feel free to post them in this thread guys. Thanks. I'll give that a shot maybe during the week next week. I guess we're gonna ride down that afternoon in the 10til4. I think me and a few guys are gonna ride to athens from that show. Anyone else is welcome to join in. I didn't check until right now, but there are 6 shows during the day, 3 within the metro area, and then 6 cruise-ins in the evening. They had a great turn out today. Last total I heard was 100 entries. Congrats to all the winners. I heard there were about 200 cars there. Great day for events, and they were all over the place! They have roughly scheduled the 2010 show for the first saturday of Oct. I just wanted to thank all the folks who showed up for the show yesterday. We did have 100 vehicles total and hopefully more bikes next year. We had taken the last two years off from doing the show so it was much like starting from scratch. Also a big shout out to all our wonderful volunteers who helped to make the show a success along with the church staff who spoke at the event and the musicians who performed. Even bigger thanks need to go to Debbie, Joyce, and Jane who run the recreation ministry at the church for being the core group who puts this on each year. I'm just the guy that goes to all the cool car shows and passes out flyers, they're the ones who actually make all the logistical stuff work. We have it in the plans to do it again next year and hopefully we'll just keep getting bigger and better. Thanks to all. Mike gave me some pictures to post. Thank you Mike! Thanks for posting them Samir. I basically gave away $25.00. Will there be a TRUE import class next year or do i need to bring a chevy 2? If you haven't learned anything about this show yet, Larry, you'll eventually figure out this show is NOT for the "late model" "aftermarket" or "custom" type vehicle...hence the reason the more stock your vehicle is...the more chance you'll have to win (in my opinion). I heard there were a lot of nice show cars that didn't get much or any recognition because something with minimal modifications won over something with many modifications.